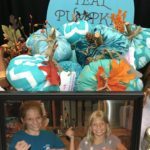 The Teal Pumpkin Project was born out of the need to keep 6 million children with food allergies safe on Halloween. Living with food allergies is a constant struggle. Eating out, parties, travel, adds to the daily safe food planning. 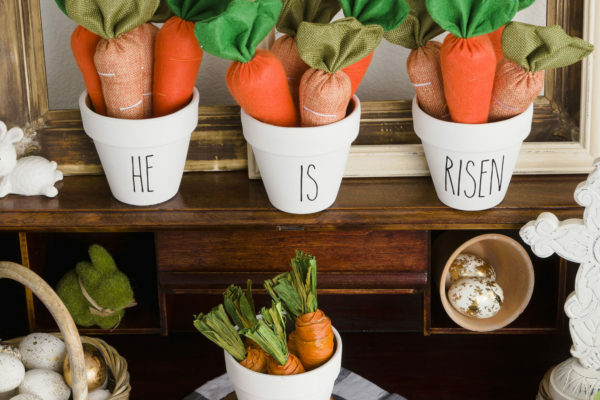 Offering non-food goodies is the safest way for food allergy suffers to enjoy the holiday. As a parent it is a huge concern anytime your child is not under your watchful eye. It is the top priority as a parent to keep our children safe therefore, avoiding some activities is the easiest way to keep our children with food allergies safe. I remember the upheaval caused by my insisting my daughter carry her EpiPen during a zoo field-trip. The school would not allow her to carry it, so I had to go on the trip with her so I could carry it. Folks are not aware that you cannot help yourself once an allergy attack starts. I know since it happened to me a few times. I felt like I was in a nightmare and could not help myself while my eyes and throat were swelling shut. With the injection of the EpiPen you are given 20 minutes to get to the ER. Not enough time for a child to figure out where they need to go in their dream-like state to get the injection and then get to the ER. So put out those teal pumpkins and offer non-food goodies to those who suffer with food allergies and avoid the life treating allergy attack. The younger sister in the photo is Julie only 8 years old and is a natural born seamstress. Julie attended my demo about making Goodwill shirt pumpkins. She came with her Mother and my first thought was she is going to get restless in a few minutes, but I was never so wrong. To my surprise and delight Julie stayed the entire day and assisted more than a handful of ladies while they learned to make Goodwill shirt pumpkins. She was an amazing assistant. 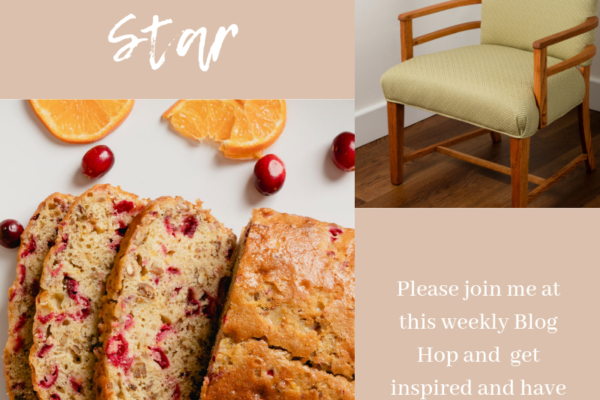 Learn how to make some too HERE. 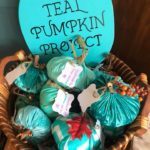 Then the idea hit me, since I wanted to promote the Teal Pumpkin Project so more homes would be food allergy safe on Halloween I would ask Polly, Julie’s Mother, if her daughter, Julie, would make some teal pumpkins for me to sell. Polly was excited to have her daughter be a part of the project. 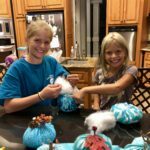 Julie taught her older 11 year old sister, Emma, to make the pumpkins too, so they both worked on the project. Displaying a teal pumpkin lets everyone know that you have non-food goodies for children with food allergies. Teal is the new orange for us this Halloween. The instructions for these easy to make pumpkins are in a past post you can find HERE. 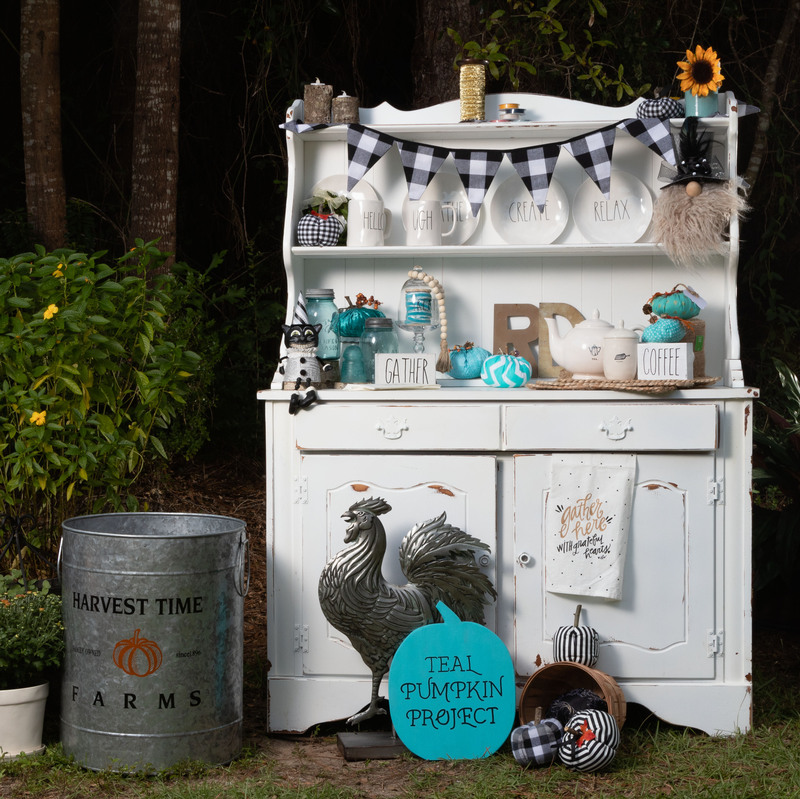 Please checkout the Teal Pumpkin Project site for some ideas for non-food goodies HERE. Also, you can print out their flyer and tape it to your door. They have one for Boo-ing your neighbors as well. Keeping everyone safe while including those with food allergies is the goal this holiday season. 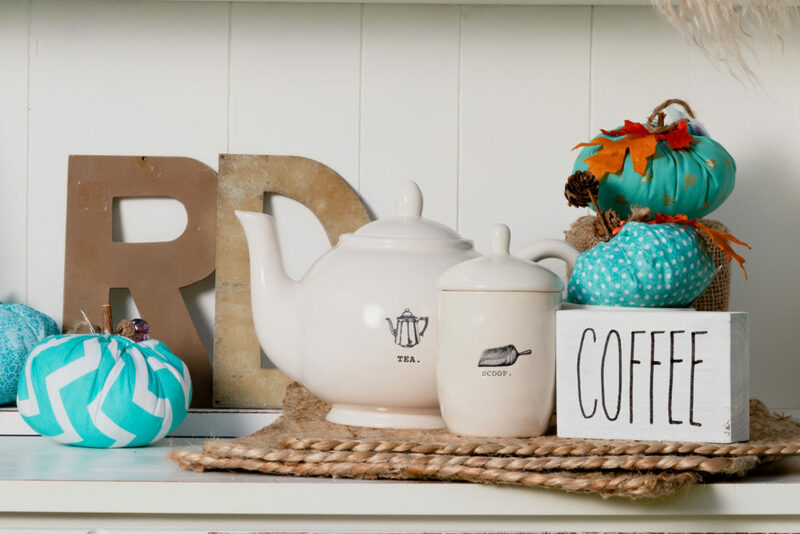 The challenge is decorating with teal pumpkins. Blue is the opposite of orange on the color wheel, so they are complementary. This is going to be fun! 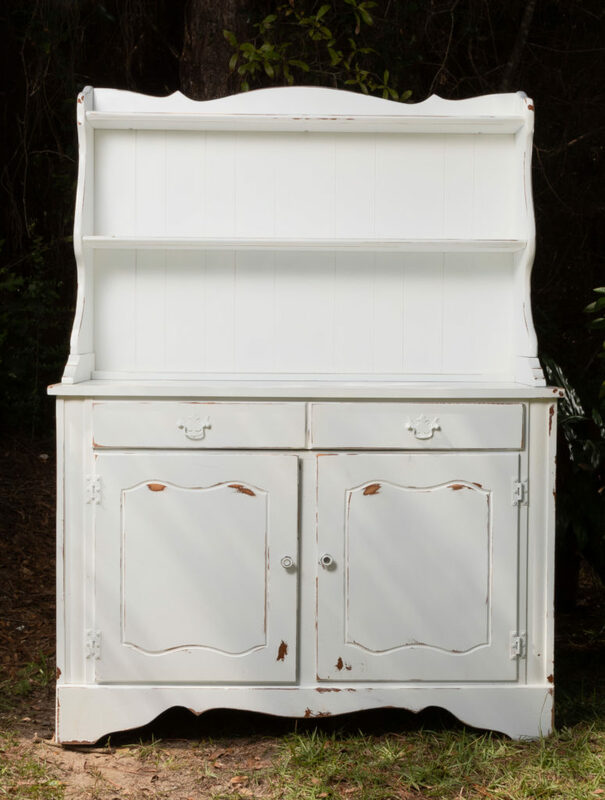 I started with a vintage kitchen hutch that I painted with Dixie Belle Paint in the color Cotton which is available at Miles Antique Mall. 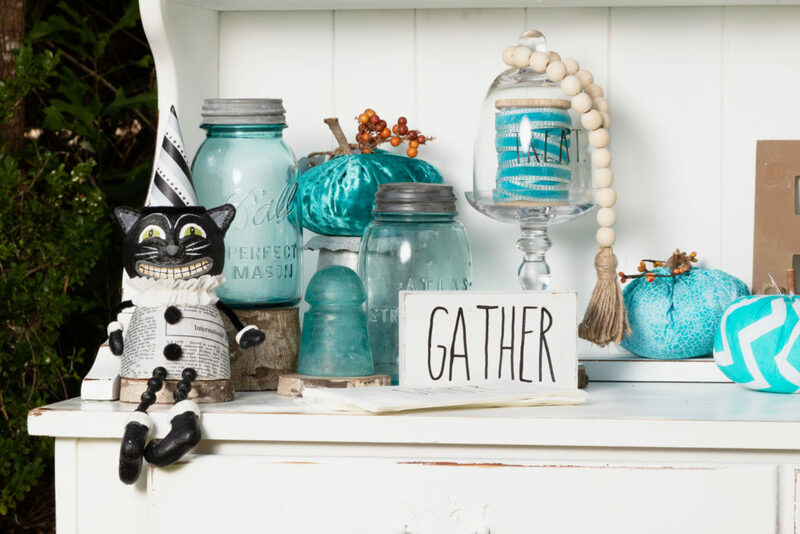 Then gathered all the elements I wanted to add including those cute teal pumpkins Julie and Emma made. I added, subtracted and moved the items until I liked how it looked. Happy with this corner’s decor placement. 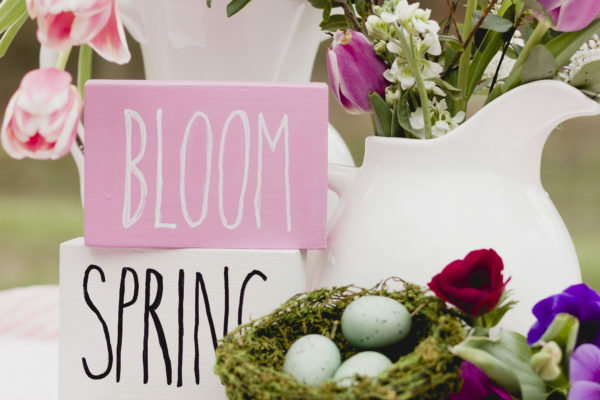 The cute Rae Dunn inspired block signs I made in an earlier post see that HERE and learn to make some too. Rae Dunn is so Fun! Coffee anyone? Coffee or tea is so much more fun served in the Rae Dunn ceramics find them in the Pensacola area at Miles Antique Mall. 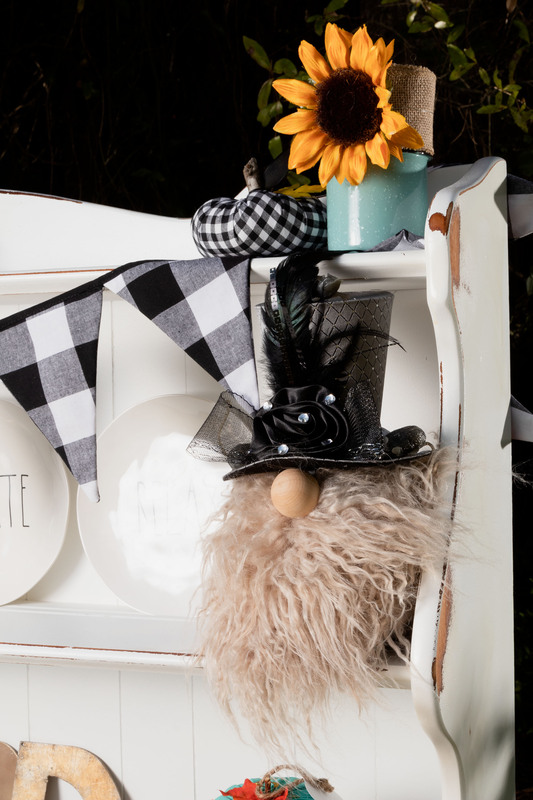 How to make this cute gnome will be in my next post so subscribe so you don’t to miss it. Happy Halloween! I love to keep in touch so please leave me a comment below.